(by Byron Tau, The Wall Street Journal) – Election administrators in Virginia ordered the state’s remaining touch-screen electronic voting machines be taken out of service in advance of the coming statewide election, after hackers demonstrated vulnerabilities in an array of election technology at a recent security convention. Virginia, one of two states holding statewide elections for governor and state legislature this year, won’t use any touch-screen machines in the Nov. 7 general election after the State Board of Elections voted Friday to revoke the certifications on all such systems still being used in the state. 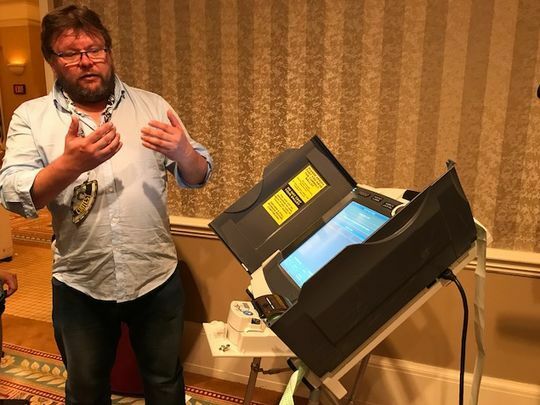 … Virginia’s decision came after one of the state’s electronic voting machines was hacked in less than two hours at the DEF CON hacking and security convention in Las Vegas in July. As part of a security demonstration on the vulnerabilities of election technology, hackers cracked a machine last used in a 2014 election in Fairfax County, Va., by exploiting a security flaw that has been known to systems administrators for more than a decade, but had not been patched on the voting system. Though the model that was hacked at the conference was already decertified by the state and wasn’t used in the 2016 election, the state still allowed use of seven other kinds of electronic voting machines until this month. The Virginia Department of Elections specifically cited the conference in a recommendation to the state board as a reason to end the use of electronic voting machines. The decision by the board gives the state’s jurisdictions that still use touch-screen electronic machines just eight weeks to obtain and deploy new technology. Administrators noted just 140 precincts serving roughly 190,000 of Virginia’s five million voters will be affected by the decision. Most jurisdictions in the state have already eliminated the technology. … The decision by Virginia to stop using touch-screen electronic voting machines marks a victory for advocates who have long criticized paperless electronic voting systems as insecure and potentially vulnerable to tampering and mischief. “Paperless voting machines with no paper backups should never have been used in the first place,” said Barbara Simons, president of the nonpartisan group Verified Voting that advocates for a paper trail and random audits. She said she hoped other states would follow Virginia’s lead in eliminating systems with no paper backups to bolster security and public confidence in their elections. Use of touch-screen machines peaked in 2006, according to data from the Pew Research Center and Verified Voting. 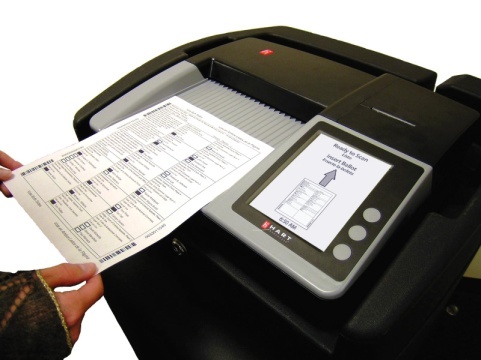 Most voters now use what are called optical-scan systems—voting by paper ballots that are then scanned and counted by computerized scanners. Other electronic voting machines also have paper backups in response to concerns about integrity. [Touchscreen machines are still in use in several states, including New Jersey, Georgia, and Pennsylvania.] Verified Voting estimates that 20% to 25% of the U.S. population still votes on electronic machine with no paper backups. 2. 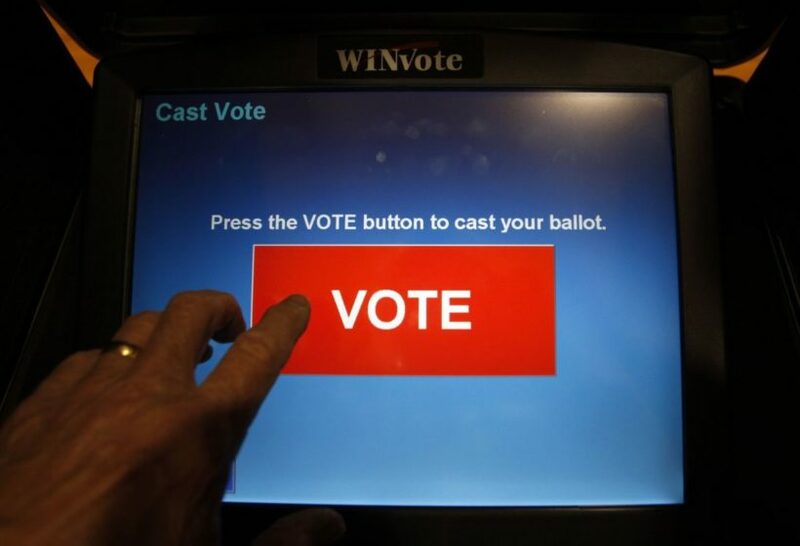 Why did Virginia’s Board of Elections vote to eliminate the state’s remaining touch-screen electronic voting machines? 3. For what reason has the Board moved to replace touch-screen machines with ones that record votes on paper instead of only electronically? 4. a) What is important to note about the voting machine that was hacked at DEF CON this year? b) How many Virginia voters will be affected by the change in voting machines? 5. a) What is an optical-scan system for voting? b) What percentage of U.S. voters still vote on electronic machines with no paper backups, according to the group Verified Voting? 6. Optical scan voting systems can allow for manual recounting of ballots and random auditing of the election equipment that reports the results to election officials. Statistically relevant auditing can serve as a tool to detect or deter malfunction or fraud. In the instance where a candidate is entitled to a recount, a full hand recount of paper ballots can determine the accurate, or final results. Officials responsible for maintaining the veracity and accuracy of elections such as election commissioners or county auditors, can randomly select a voting block such as a precinct to verify the optical scanning voting system tabulation and report is accurate by doing a hand count against the machine’s results. By performing such an audit, election officials can confirm the system is in good standing. Or, if an error in the counting is discovered during a random audit of the machine(s), a full recount can be conducted, and the system evaluated for the source of failure or fraud. Should voters in every state demand that their state and municipality use an optical scan voting system? Explain your answer. 7. Voter fraud and election hacking should both be prevented by the states. In addition to securing the actual votes, steps must be taken to ensure that only registered voters are voting (no voting in two places, or deceased people voting, or ineligible people voting). Measures like Voter ID laws have been taken to ensure only registered voters are voting. A total of 34 states have laws requesting or requiring voters to show some form of identification at the polls. Another way to prevent voter fraud is to clean the voter rolls. Liberals/Democrats oppose Voter ID laws because they say requiring ID discriminates against and disenfranchises* minority and elderly voters, who they say do not have, or are not able to afford, ID – especially a drivers license. (*Disenfranchise: to prevent (a person or group of people) from having the right to vote). They also say this type of voter fraud is minimal or non-existent. Conservatives/Republicans refute this by listing all of the things people need to show ID for (doctor, banking, school, government assistance…), as well as saying people who can’t afford an identification card should be provided one for free from the government – that it does not have to be a drivers license. They say it will prevent voter fraud. a) Does voter fraud exist? Explain your answer. b) Are Voter ID laws a good way to prevent voter fraud, or are they discriminatory and prevent certain groups of people from voting? Explain your answer.